Since this has finished its run and I didn’t start recapping this series in a timely manner, I guess that’s why I don’t recap in a very timely manner either. Ming Ming is busy trying to cook when Shao Tian comes in and says that he went the wrong way and goes to head back out. She asks him what he’s playing at and says that since she’s cooking, he must have went to the wrong place. Ming Ming asks if there’s something wrong with her attempting to cook and he says as long as he’s not eating it, it’s fine. Shao Tian then asks if she’s going to Zhuo Jie’s celebration party. Ming Ming says she isn’t going and Shao Tian asks about Eason. Ming Ming says that Eason is going, but refusing to eat until he can make it to her place. 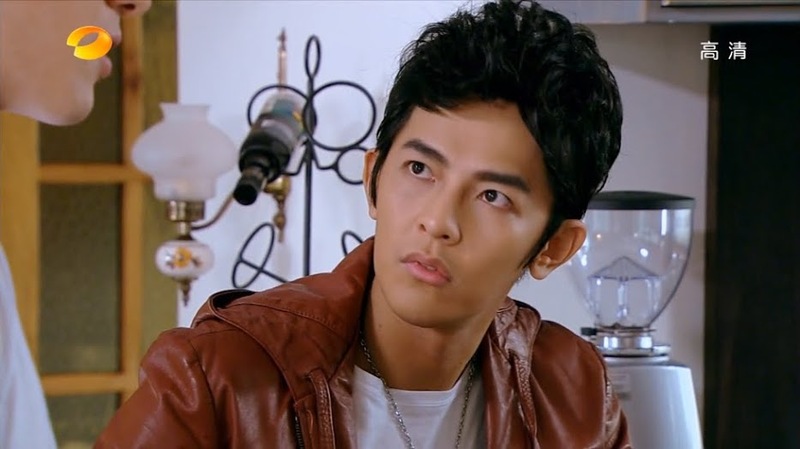 Shao Tian says that while he doesn’t like Eason, he pities the poor man for giving up good food to be Ming Ming’s mouse. At the party, Eason keeps clockwatching his cell when Henry comes up and asks for his help to be introduced to a group of ladies. Eason says he’ll help in a minute and goes off to use the restroom. We then cut to see the scene from the previous episode between Tom and Pei Ni so I’m not going to elaborate on it again. Eason comes up and sees Tom manhandling Pei Ni and interrupts. Pei Ni says she’s fine as Tom is an old friend she needs to talk to who doesn’t know his place. She and Tom go off and Eason makes a call to Ming Ming saying he’ll be late and to eat a bit. Henry overhears this conversation and can’t believe that Eason is still attached to Ming Ming. Is it because he can’t get rid of her? Eason says that isn’t the case at all, but Henry can’t figure out why Eason would still hang around her since he’s officially landed the leading role. Eason does assure Henry that he did NOT sleep with Ming Ming to get the role and says that they have a very special relationship. When Henry asks for an explanation of their relationship, Eason doesn’t explain it and Henry can only think it’s a dirty relationship. The two leave and Shao Tian comes out of the bathroom stall looking very upset. Outside, Shao Tian gets angrier as he sees Eason and Henry together with a group of girls. Eason isn’t interested, but Henry won’t let him get away. 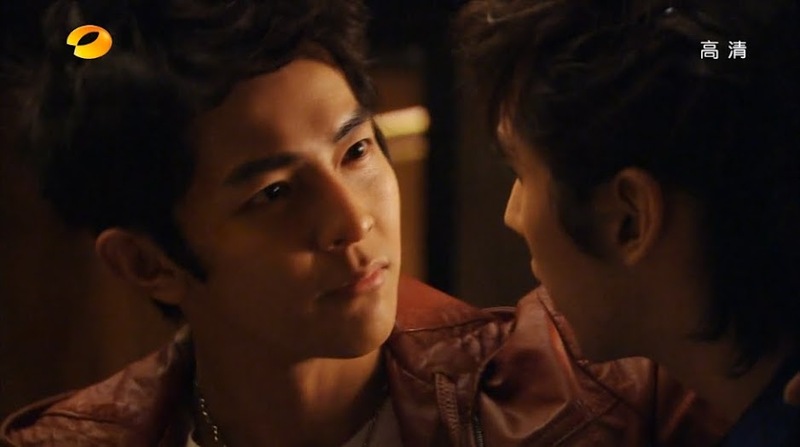 Shao Tian then recalls the bathroom conversation and looks very upset. Looks like he’s no longer going to accept their relationship now. Meanwhile, Ru Er sees Pei Ni having an argument with Tom. That can’t be good for Pei Ni. Soon all the leads gather with an investment. Eason asks to leave early and Shao Tian tries to get him off the hook with the party, but looks like Eason will be forced to go to KTV (famous karaoke place) with everyone else. He then finds time to call Ming Ming to let her know that he will much later than anticipated. Ming Ming tells him they can always postpone, but Eason insists that he will show up. Shao Tian heads back over to Ming Ming’s place to update the blog. She asks why he’d do that at her place instead of his own. Shao Tian says its so he can get a free midnight snack that he didn’t have to cook. He goes to sneak some food, but Ming Ming tells him its for Eason only—besides, didn’t he say her cooking was bad? Shao Tian cannot believe that Ming Ming still thinks Eason will show as it is likely the party will go into the wee hours of the morning. Ming Ming says that she has just got off the phone with Eason who promises to show up. Shao Tian says that Eason is lying. He then reveals the overheard conversation and seeing Eason hitting on a group of girls with Henry. Ming Ming doesn’t believe this and this annoys Shao Tian. She’ll believe Eason over him? He then calls her too bighearted that she can accept her boyfriend staying out and having fun while she sits at home. Shao Tian then says her judgment is off. Ming Ming then demands to know why Shao Tian thinks so poorly of Eason. 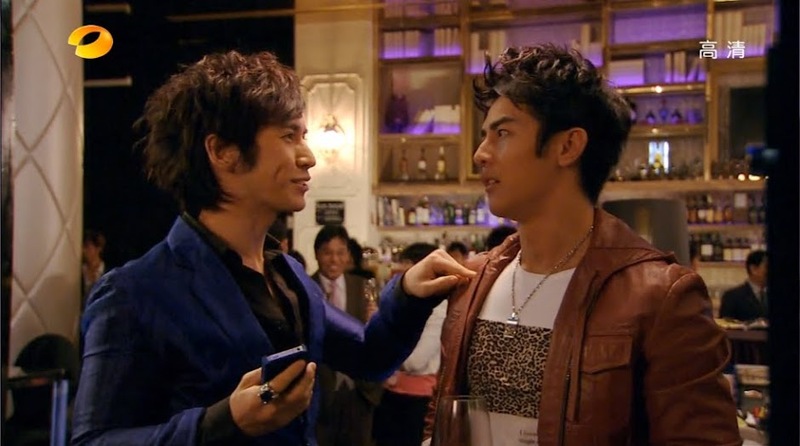 The two argue and Shao Tian bets that he’s right and Eason won’t show up. At KTV, while everyone else is having fun, Eason participates, but keeps looking at his watch. I’m waiting for something bad to happen because we always see him with alcohol. Sure, he’s nursing it, but still, he hasn’t eaten anything. Back at Ming Ming’s, Shao Tian crashes unhappily on the sofa while Ming Ming works. Both are not in a good mood. So who will be right? The party does, indeed, get out late. Eason sends his drunk mother home with Henry so he can hurry to Ming MIng’s. Shao Tian wakes up sees Ming Ming sleeping at the counter. He asks if she wishes to go in and sleep, but she’s dead to the world. Shao Tian takes off his sweater and puts it over her as he recalls her asking for his blessing. He then goes to the restroom to wash up. Ming Ming wakes up and sees Shao Tian’s sweater. She looks over at the couch, but he’s not there. She closes her laptop and then the doorbell rings bringing Eason. Ming Ming is happy to see him and he immediately apologizes for coming late. Inside Eason eats ravenously. He asks what the taste is and Ming Ming freaks out—does it taste bad? She goes to take the food back, but Eason says it is the taste of concern and happiness. This makes Ming Ming happy and she takes the cold food away. Eason again apologizes for making her wait all night, but Ming Ming is very understanding. Enter Shao Tian done with his washing up. He immediately scolds Eason for showing up after the sun has risen. Ming Ming doesn’t care because he at least did show. She then tells Shao Tian to hurry and rest since he worked at her place all night. This catches Eason’s attention and he’s not happy at all—Shao Tian spent the night at Ming Ming’s? Shao Tian asks if that’s a problem and then asks where Eason went after KTV and how many girls he hit on with Henry. 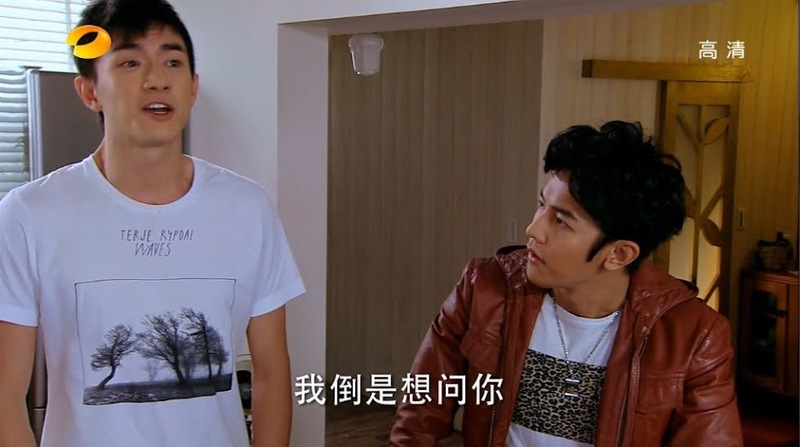 Eason starts getting annoyed when Shao Tian starts spouting off parts of the conversation he overheard between Eason and Henry. Ming Ming tries to stop him, but Shao Tian continues and Eason yells at him for snooping. Shao Tian then says if he’s not doing anything bad, then why would he be angry about Shao Tian overhearing the conversation. Eason says that Shao Tian doesn’t understand the situation and asks why the younger man is determined to ruin their relationship. Shao Tian angrily says that he doesn’t like Eason and doesn’t want Eason as Ming Ming’s boyfriend. Ming Ming says that Eason’s arrival proves he didn’t lie to her and she sends Shao Tian out. She apologizes for the younger friend and Eason shakes it off and happily goes back to eating her meal. During filming, Eason turns positively green. The director notices this and tells Eason to rest and they’ll send someone for medicine. Qiong Zi says that she’s already bought him medicine and hurries him back to the dressing room. Ming Ming arrives at this moment and is horrified that she’s the cause of him being ill. Eason says it’s not her fault and asks why she’s there. At this time Zhuo arrives and wonders why Ming Ming is there, too. Qiong Zi quickly says that Ming Ming is there to discuss the script with Eason and Zhuo asks who would dare to write anything without her approval. Qiong Zi and Ming Ming leave Eason and Zhuo alone. Zhuo immediately says that Qiong Zi doesn’t take care of Eason well enough. She wonders why Eason hasn’t signed the contract yet as Zhuo will give him better terms and more freedom. Eason says that he doesn’t want to talk about it and Zhuo tells him to recover and think more on her offer. Outside, Qiong Zi apologizes for Eason not recognizing Ming Ming and his relationship, but the girl should know how the entertainment world is. It’s better for Eason’s career if Ming Ming stays in the shadows. Qiong Zi says that despite this, she does support Eason’s and Ming Ming’s feelings for each other. LOL. You have to love dramas that reference another drama or the real life actor themselves. After Ming Ming leaves, Qiong Zi says she was just like Ruby Lin’s character from Princess Returning Pearl. This happens SOOO often in dramas. Like in Cindy Wang’s baking drama, her character Mei Li mentions getting an autograph from pop star Cyndi Wang. Eason rushes to the bathroom, dropping the documents that Zhuo gave him. Qiong Zi comes in and sees this contract. She is NOT happy. She quickly gathers up the papers as Eason comes back out, still suffering. She acts like everything’s normal, but when Eason tells her not to bother answering his phone since it’s a reporter she can’t handle. This upsets Qiong Zi. There are more capable managers everywhere she is sure. Eason agreeing to everything she’s saying isn’t helping. He even tells Qiong Zi to learn from Zhuo jie. Awww. Poor Qiong Zi. But there does come a point where people do have to choose between jobs and relationships, meaning Eason will need to do whatever is best for him. Although, Qiong Zi personally cares about Eason while all Zhuo cares about is dollar signs. Eason and Pei Ni are filming their real estate commercial. When it comes time for Eason’s solo filming, Pei Ni goes off when Bao Kang arrives and asks if filming went well. Pei Ni says that’s up to him to decide since he’s the client. The oily arse then says he hopes that Pei Ni’s bright smile was for him alone. GAG. He then pulls out a diamond ring and puts it on her finger before getting down on his knees. The two are then swarmed with reporters to record the scene. Pei Ni is definitely NOT happy with this situation at all. When she says nothing, Bao Kang takes it as a silent acceptance—he trapped her. Her mom even comes out crying that she can finally see this day. Looks like it was all Pei Ni’s mother’s plan. The crowd disperses and Ru En says that a celebrity mother like that is a cockroach that won’t die. Shao Tian asks why she isn’t going for the big scoop of Pei Ni’s marriage. Ru En replies she hates reporting the same news as everyone else. She then pulls out photographs and asks if Shao Tian knows who the man in the picture is (Tom). Shao Tian doesn’t, but he does warn Ru En that if she harms the drama at all with her digging, then he will never forgive her. Back at the studio, Pei Ni is looking unhappily at the engagement ring when Eason comes to find her to tell her that the scene change is taking longer than expected. Pei Ni then apologizes for what happened earlier because of the exaggerated proposal. Eason replies he feel’s honored to see the proposal since marriage is such a big, happy step. Pei Ni says Eason can keep his congratulations. You know she’s not happy, but since she already “accepted” the marriage, how can she do anything now? Eason asks her why she looks so lonely now. Pei Ni talks about disappointment in marrying a rich man and thus becoming a failure. This attitude amuses Eason. He thinks it’s just cold feet before the wedding. He then encourages her by saying she manages her career well, so she can surely manage her own life well. This does oddly cheer her up. The news reports Pei Ni’s engagement and airs an interview with Eason who congratulates Pei Ni. He also says he believes there’s someone out there secretly by his side, too. This makes Ming Ming happy. She goes to call or text Eason, but recalls Qiong Zi’s words about giving Eason space. Ming Ming then sits down and tries to get to work. She seems a little stumped, so she takes out her phone and plays the video she recorded of Henry and Eason performing together at the club. Jiro’s theme song really does work well for this drama. Ming Ming goes to the set and happily watches Eason from afar. When he leaves work on his bike, Ming Ming quickly follows behind on her own, keeping a safe distance…which totally looks like stalking. When Eason feels there’s someone behind him, he turns, but Ming Ming has hidden herself. He turns back and continues on his way with Ming Ming beaming and still following him from a distance until he reaches home. Ming Ming wishes him a good morning and peddles off when Eason comes back outside on his bike. This time he’s the one following from behind happily. Nothing like two people happily stalking each other. When Ming Ming stops for traffic, she turns and Eason is by her side, surprising her. She asks what he’s doing there and he replies that since she secretly takes him home, then why can’t he do the same? LOL. The two arrive and Ming Ming’s apartment and she quickly tries to usher him away afraid of pictures. Eason says they don’t have to worry about photographs at her place. He then asks why she followed him and didn’t call or talk to him these past few days. Ming Ming explains she doesn’t wish to be a bother since he’s very busy. Eason pulls her into a hug and says she’s not a bother. Ming Ming says Eason is her private charger and with that hug she can keep on going for a long time. She again tries to send him home and Eason refuses as he wishes to recharge himself a little longer. He then asks Ming Ming to go on a private vacation with him when things get less busy. Ming Ming is working hard when Shao Tian quickly drops off her breakfast and newspaper. Ming Ming is shocked by how fast he’s leaving. Shao Tian tells her to read the newspaper—Ru En has done it again. What has she done? She reported that Pei Ni is actually 30 and NOT 24. Wow. A celebrity that lies about their real age? And a female one at that? SHOCKER! Of course, this causes chaos and reporters swarm the studio wanting to know if Pei Ni is really 30 and if her educational background is as fake as her age. Eason comes in and the reporters immediately swamp him for a comment. Zhuo tries to get Eason out of there, but Eason delivers a statement saying reporters are sick. There is nothing wrong with Pei Ni being 30. She’s a serious actress devoted to her craft and if age doesn’t effect that, then who cares? Eason does have a very valid point—too bad the entertainment industry is big on age. Pei Ni’s mother comes out and tells the reporters to leave Eason alone since he is an innocent bystander. She then says that Pei Ni never admitted to being 24. This was a mistake of the paparazzi that they never had time to get corrected. The reporters then ask about Pei Ni’s educational background. Pei Ni replies her daughter did study in New York, but no one ever said she got a diploma. Zhou and crew then head back to the studio. Filming wraps and Pei Ni’s assistant quickly tries to hide the newspaper, but Pei Ni does catch the headline and looks very displeased. Zhuo comes and tells her to leave early. In her dressing room, Pei Ni is getting scolded by her mother for the news leaking out. Bao Kang even had his secretary call to break off the engagement. Pei Ni says nothing this entire time and this angers her mother. Pei Ni finally snaps and asks if her mother is considering Pei Ni’s future or her own. Pei Ni’s sole desire is to get as far as she can with her skills, but her mom doesn’t understand that and forces her to go to all these social gatherings. Pei Ni then says she’s glad that the news broke as she could see Bao Kang’s true character. She then begs her mother to stop using her to raise her social status. Pei Ni’s mother cannot believe her daughter said such a thing and leaves crying. We end with Pei Ni in tears as well when Eason finds her. End episode. Wow. What an episode. Surprisingly the Pei Ni-age-crisis isn’t dragged out too long but I felt really bad for her when Bao Kang proposed to her in front of the media. Obviously he did it so she would be forced to accept his proposal. I had a feeling Pei Ni’s big age and education crisis wouldn’t drag out too long. Although, I admit to being surprised that Bao Kang dropped out so fast…or does the arse show back up again? I HATE public proposals. They are evil. And whether or not Pei Ni misunderstood her mother’s intentions, that was a horrible thing for her mother to get Bao Kang to do just so Pei Ni wouldn’t be able to refuse the proposal without looking horrible.